Norwich City have made two more January transfer window signings to bolster their League One promotion push. 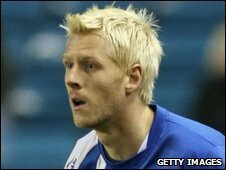 American-born defender Zak Whitbread, 25, has joined the Canaries from League One rivals Millwall. And he will be joined at Carrow Road by 22-year-old Oli Johnson, a former non-league striker who turned professional 15 months ago when he joined Stockport. Both players have been signed for undisclosed fees, and have agreed two-and-a-half year contracts. Whitbread was close to joining Swansea City last September, while Johnson was also the subject of an inquiry from a League One club, Peterborough United, who had a bid turned down. Norwich boss Paul Lambert has now made four signings since the window re-opened last Friday. Peterborough defender Russell Martin and Swindon Town winger Anthony McNamee both signed on Monday, also for undisclosed fees.